The Google Chrome browser, running the latest version. 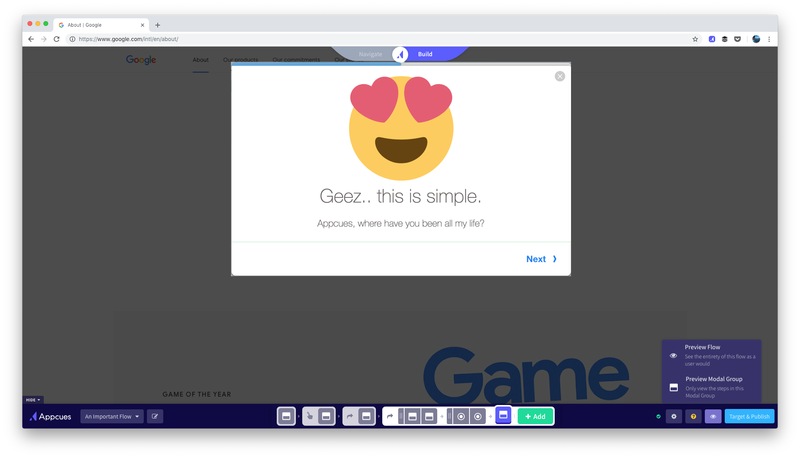 The Appcues Flow Builder Chrome extension (download it here). 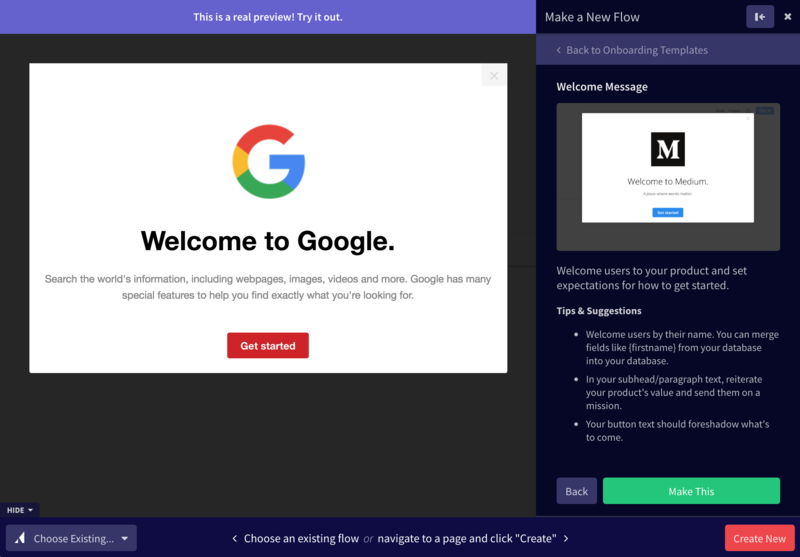 Two ways to launch the Flow Builder and get started: from your my.appcues.com dashboard, or from your website, using the Chrome extension icon. From my.appcues.com, select the "Flows" option from the navigation on the left-hand side. Click on the Create button in the top right corner of the Flows list. Enter the page on your website you'd like to start building your flow on, and then select Next. Navigate to the specific URL you'd like your flow to start on. Click on the Appcues Flow Builder icon in your Chrome extension list. The Flow Builder will load on the page designated. 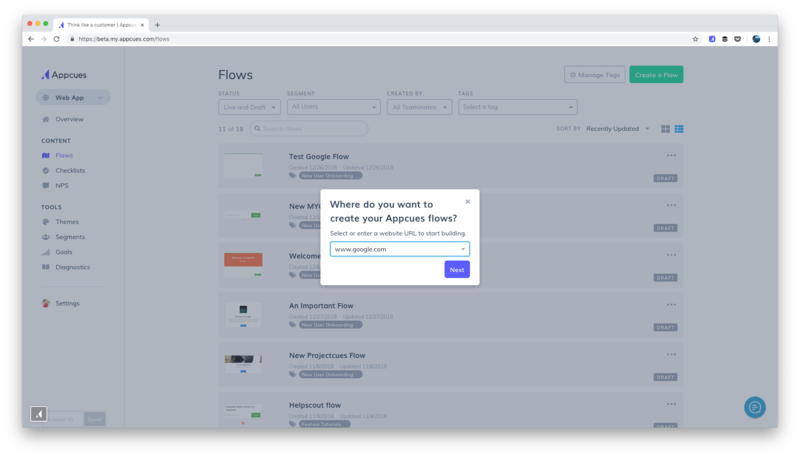 Once ready, select Create New, and select the pattern you'd like to use for the first step in your flow. Note: Each flow can span multiple pages within a single domain, contain as many steps as you like, and utilize all patterns. While building its often helpful to preview your flow. To preview, select the eye icon from the right hand side of the Flow Builder bar. Once you've finished your masterpiece, you'll define which users will see this flow when published. 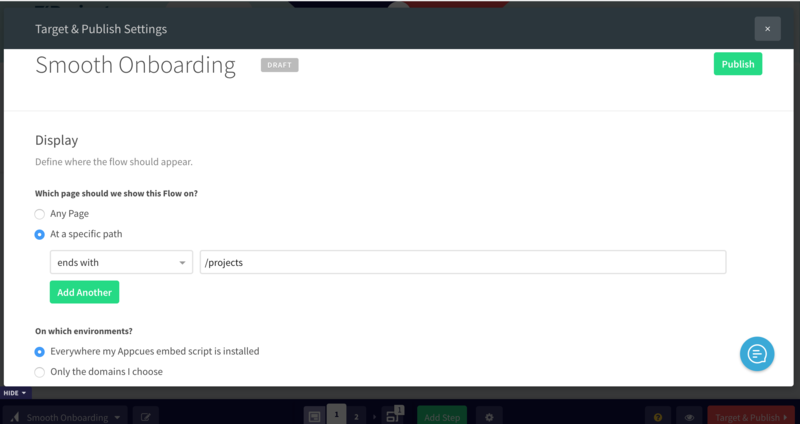 Click on the Target & Publish button in the Flow Builder. This will take you to the Flow settings page. Here, you can control the URL(s) where you'd like the flow to show live, how often it shows and to which segment of your customer base it shows to. If you already know who you'd like to target, but aren't clear on how to do it, you can learn all there is to know about targeting flows. Once you've built, previewed, and targeted your flow (and maybe used test mode for good measure), you're ready to publish. If you have the Appcues script installed on your website, it's as simple as hitting Publish, and you're live! Afterwards, you can continue making changes to your flow content and settings, and use the Push Changes functionality to publish the updates.